Cain Chamberlin of Wyalusing will assume the role of executive director of the Endless Mountains Heritage Region on Aug. 30. 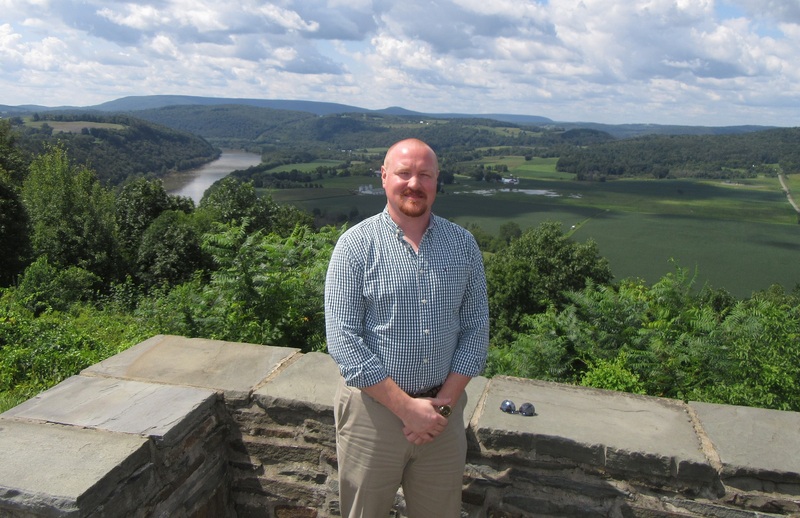 Wyalusing native Cain Chamberlin has been named the new executive director of the Endless Mountains Heritage Region (EMHR), effective Aug. 30. Chamberlin has been employed since 2014 as a news reporter and layout editor for the Rocket-Courier newspaper, which covers the same four counties in which he will serve at his new post with the EMHR. Previous to the Rocket-Courier, Chamberlin worked in southern New Jersey, where he wrote for four local publications, including the Cape May Star and Wave. He garnered experience there working directly with business heads, organizational leaders, elected officials and members of the public that made him a perfect fit for the Rocket-Courier and set the stage for him to make more of the marketing and public relations courses he had taken at Lockhaven University. Chamberlin saw the opening at the EMHR as an opportunity to flex his skills and build relationships in a broader arena. He embraces the organization’s commitment to preserving and promoting historical sites and its support of environmental endeavors, including stewardship of the Susquehanna River and other waterways. “I don’t think that the tributaries get enough credit, despite their value for fly fishing and kayakers,” he remarked. Chamberlin cited the French Azilum historic site in Bradford County as one of his favorite to visit, noting that he just covered a Civil War encampment event there. He is impressed with the ongoing renovation of the Troy Sale Barn and Arena, which has received funding from the EMHR. He has hiked segments of the Loyalsock Trail in Sullivan County and enjoys Worlds End State Park. As a Boy Scout, he endured polar bear camping experiences at Camp Brulé in addition to camping there in the summer. He got to know Montrose and much of Susquehanna County working real estate auctions with Jerry Burke. He refers to Tunkhannock in Wyoming County as one of his favorite small towns. “It’s got a great old main street,” he stated. Chamberlin intends to acquaint himself with members of the four counties through a series of meetings over the next two months, while also immersing himself in the business of grant administration for current and upcoming projects. He will be introduced to the greater board and membership at the EMHR’s annual membership meeting and banquet at the Wysox Fire Hall on Friday, Oct. 12. For current news about the EMHR, follow Endless Mountains Heritage Region on Facebook.